Photo by Andrew Moore, CC BY-SA 2.0 Just outside Po Lin Monastery in the mountains of Hong Kong's Lantau Island you'll find the Tian Tan Buddha. Climbing the 268 steps to stand at the base of this 112-foot-tall seated bronze Buddha is well worth the thigh burn. The Big Buddha, as it's often referred, was completed in 1993. Its base was modeled after the Altar of Heaven or Earthly Mount of Tian Tan at the Temple of Heaven in Beijing, China. While there, don't miss a trip to the adjacent monastery. 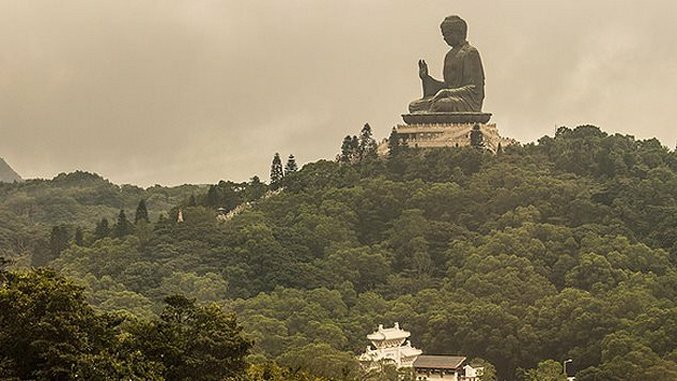 It's considered one of Hong Kong's most important Buddhist sacred places. Photo by GTSA South America, CC BY-NC 2.0 The only statute in this gallery to also be listed as one of the New Seven Wonders of the World, Brazil's Christ the Redeemer is certainly a bucket list-worthy site. The Art Deco statue of Jesus stands at 98 feet tall atop Rio de Janeiro's Corcovado Mountain in Tijuca Forest National Park. The statue was completed in 1931 and was designed by Polish-French sculptor Paul Landowski. It's made with concrete and features thousands of soapstone tiles. Visiting the statue also provides incredible panoramic views of Rio, including Sugarloaf Mountain and Guanabara Bay. There are a number of ways to reach it. The easiest of which being by rail or road and the hardest of which being by foot. The latter takes between 2-3 hours. Photo by Jonathan Combe, CC BY 2.0 The Kelpies are officially the largest equine statues in the world. They can be found just 19 miles from Edinburg in Falkirk, Scotland. The sculptures are part of a land transformation project known as the Helix. The Kelpies feature two massive stainless steel and steel-clad horse heads. They stand at nearly 100 feet tall and can be toured from within as well. The Kelpies opened in 2013 and are the work of sculptor Andy Scott. Photo by Neil Howard, CC BY-NC 2.0 The mythical and legendary Merlion stands guard over Singapore on the shores of Marina Bay. It features the head of a lion and the body of a fish and has long been an icon of the Lion City. The Sentosa Merlion was completed in 1995 and while it's not the only of its kind in Singapore, at 28-feet tall it is the largest and most significant on the island. You'll also find a 6-foot tall Merlion cub behind it. A visit to the Merlion is a must while in Singapore. It also provides great views of Marina Bay Sands Hotel, the Central Business District, Esplanade Theatre, ArtScience Museum and more. Photo by Hardat Baraf, CC BY-NC 2.0 New York City's Statue of Liberty is undoubtedly one of the most famous in the world. In fact, hundreds of replicas of Lady Liberty span the globe from Las Vegas to Japan. The original was a gift from France to the U.S. in 1886. The torch-bearing, crown-wearing, robed figure is made of copper and stands at 151 feet tall on Liberty Island in New York Harbor. With a reservation, visitors can travel up into the Statue of Liberty's crown. A trip to Ellis Island and the Immigration Museum are also often combined with visits to Liberty Island. Photo by Marco Fieber, CC BY-NC-ND 2.0 The infamous warrior and founder of the Mongol Empire is memorialized in the 130-foot-tall Genghis Khan Equestrian Statue just outside of Ulaanbaatar in Tsonjin Boldog, Mongolia. The statue features Genghis Khan on horseback and sits on the banks of the Tuul River, where legend has it he found a golden whip. It was completed in 2008 and is the largest equestrian statute in the world. It's is part of the Genghis Khan Statue Complex, which also includes a visitor center and museum with archaeological exhibits featuring relics of Mongolia's history and culture. Photo by Davidlohr Bueso, CC BY 2.0 Standing at 140-feet tall just seven miles outside of Kuala Lumpur in Selangor, Malaysia you'll find the world's tallest statue of the Hindu deity Lord Murugan. It is also the tallest statue in all of Malaysia. The Lord Murugan statue took three years to complete and was unveiled in 2006. It stands at the base of Batu Caves, which houses Batumalai Sri Muruga Perumal Kovil. While the statue itself is a worthy draw, don't pass on the opportunity to tour the caves. Temple Cave, one of several on the site, is well worth the 272 steps to the top. It features a vaulted 300-foot ceiling and ornate Hindu shrines. While there be mindful of the sometimes overly-friendly long tailed-macaque monkeys that roam the stairs and caves freely and in large quantity. They aren't too shy to steal your snacks, hat or sunglasses. This week’s Bucket List brings your seven of the most iconic and magnificent statues around the world. These structures have religious, cultural, and historical significance not just in the countries they call home, but the world over. From Singapore’s Merlion to New York’s Statue of Liberty and Rio de Janeiro’s Christ the Redeemer, these are landmarks not just work seeing when you happen to be near them, but worth traveling for. Paste Travel’s Bucket List columnist Lauren Kilberg is a Chicago-based freelance writer. Her travels have found her camping near the Pakistani border of India and conquering volcanoes in the Philippines.